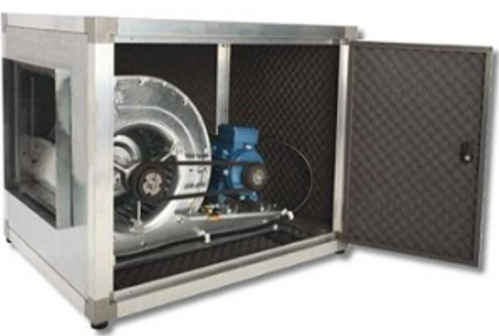 KPB (belt driven) from size 9/9 to 30/28 are a range of supply or extract box fan for inline. The casing is made of an aluminum frame with single skin or double skin galvanized steel panels (upon request). These fans are designed for indoor and outdoor installations with low to medium pressure drop whilst keeping very good sound performances. Double inlet belt driven range with airflows from 700 to 50 000 m3/h IP 55 F Class IEC motors (IE2 Motors) (380 V 50 and 60 Hz). Suitable for operating temperatures of up to 50°C. Robust and quiet operation thanks to the galvanized steel fan and motor support mounted on 4 anti-vibration rubber plots. Low noise level: Anti-vibration rubber adjustable feet are fitted below the fan casing. Outlet connected to the casing through an 18 mm thick rubber joint acting as a flexible seal, the sizes 20/20 to 30/28 have a flexible canvas. Quality casing with aluminum profile structure, plastic corners, M1 fire rated 15 mm isolation through pyramidal foam. Easy access: A maintenance access door on the side is fitted with polyamide hinges and 1/4 turn lock and key. Easy to install with motor wired to the IP 55 connection box. Efficient double inlet galvanized steel forward curved impeller balanced statically and dynamically. The standard air entry is done by spigot. From the sizes 20/20 to 30/28 have baseframe instead of feet. Belt driven box fan suitable for outdoor installation fitted with a forward curve double inlet impeller and IP 55 F Class motors. The casing is made of aluminum profile structure and 1 mm galvanized steel panels fitted with 15 mm M1 foam insulation. A maintenance door with polyamide hinge and key is located on the side of the box. The impeller and motor shall be fitted on a galvanized steel support with 4 anti-vibration rubber plots and the impeller's outlet connected with the casing through a 18 mm thick rubber joint.